ABB launches new DS-ARC1 arc fault detection device (AFDD), with integrated residual current circuit breaker with overcurrent protection, aimed at bridging the gap in circuit protection. ABB has entered the ongoing arc fault detection debate with the launch of a new “belt and braces” arc fault detection device (AFDD). Following the passing of new regulations in Germany last year, making it a legal requirement to install AFDDs in the electrical switchboard of certain types of buildings, including kindergartens and homes for the elderly, consideration is now being given as to whether this should be extended to cover all buildings. Current protection devices installed in most domestic consumer units do not provide complete protection against all types of arc faults. Residual current devices (RCDs) can only detect earth arc faults, where there is current leakage to ground, whereas miniature circuit breakers (MCBs) can detect parallel arc faults, but only according to their intervention time curves. Series arc faults, on the other hand, will remain undetected by both MCBs and RCDs. This gap can be closed by installing an AFDD. In response, the new DS-ARC1 device from ABB offers protection against all arc faults, including series arc faults, which could otherwise go undetected by traditional MCBs and RCDs. Daniele Pandolfo, ABB’s Global Product manager for AFDDs explained: “At ABB, we are dedicated to providing smarter solutions for a building’s electrical installation. 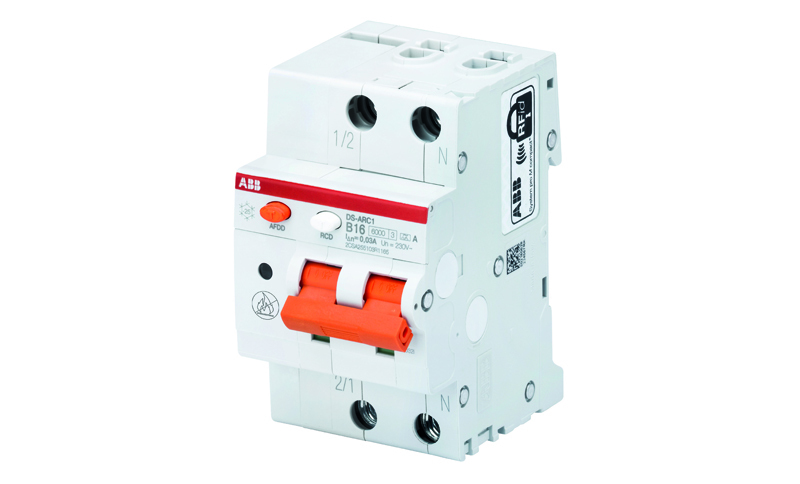 Completing the existing S-ARC1 range, DS-ARC1 is a new 1P+N device with integrated RCBO. It is available in 6 kA and 10 kA breaking capacity and integrates with ABB’s System pro M compact® range, reducing the risk of fire by providing complete protection against arc faults, over-voltages, overcurrent and earth fault currents. Other key features include: easy cross-wiring and installation; the option to feed cables or busbars either from the top or bottom for hassle-free installation; a useful LED to troubleshoot network issues, monitor the device’s operation and reduce downtime in the event of tripping; and a handy memory recall function.